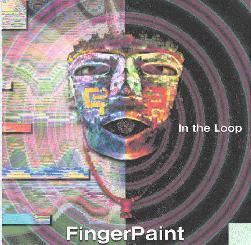 Fingerpaint - "In The Loop"
Remember all those albums years ago that bragged about how they were purely electronic and no conventional instruments were used? Well here's an ambient soundscape disc that is somewhat the opposite. Patrick Smith and Steev Geest mix a variety of guitar synths with loops to create aurally pleasing textured soundscapes that run the gamut from space journeys to more adventurous sound collages. When I inquired about the instrumentation, Smith explained that most of what they do is set up with MIDI guitars and everything is run through filters and effects so that the listener doesn't really hear plucked strings. In The Loop is their second CD release. Among the highlight tracks is "Occupation Zone". I'm technologically clueless so it's pretty fascinating to listen to this knowing there are no keyboards. There are a lot of freaky space noises creating a background while a bassoon sound plays a slow-going lounge melody. Things get even more detailed when a techno percussion beat comes in and the space sounds come more into the forefront. On "Enormous Expansion" we travel to the dark edges of space. Various blips and whooshes play against an orchestral wall of sound. It sounds like raking across piano strings and sustained notes from the lowest bass end of a grand piano. "Trapped" travels even further into the darker regions of space and the atmosphere the duo creates is intense and even a bit disturbing. More cool sounding "piano"work. This is what Major Tom experienced when he lost all contact with Earth. "Tunneling" is an ambient space journey, but includes a lot of walking and opening and closing doors. Is space a big house with its own rooms that you can explore? It feels that way. "Keep Your Eyes Peeled" is quite different from the other tracks but no less cosmic. A drugged jazz combo collage tune lead by a trumpet (a Roland Gr-1 guitar synth) and accompanied by bashing wah-wah bass, wild percussion, and assorted other sounds that make this a bit jarring relative to the previous tracks. An avant improv tune that shows a different, and sometimes humorous, side of Fingerpaint. Smith and Geest are creating some really interesting music running guitars through their various "toys" and have produced a collection of creative space soundscapes in the process. However, this is not standard floating electronica as there is far more happening in terms of sound, atmosphere, and themes.